As I mentioned a couple of weeks ago during the New Year’s round up posts, I’ve gotten a lot more into bread baking the past year. One thing I had the opportunity to make yet was crusty breads. To achieve that crusty effect, most recipes require a “sponge”, which usually is made the night before you plan to bake the bread. Which, of course – I never seem to have my act together enough to plan ahead for that. We were having soup for dinner last week, and I wanted some French-type rolls to go along with. But, it was cold and rainy – really wasn’t feeling going to the store. So, I turned to my cookbook for inspiration. Cook’s Illustrated had a recipe for dinner rolls that claimed the crunch of a crusty roll, without the time commitment. It was a few more steps than your standard yeast roll recipe, but I was pretty sure the finished product was going to be worth it. The rolls were airy and chewy on the inside, with a nice thick crunchy crust. This will definitely be my go-to bread when I want something with a little more body than a traditional yeast dinner roll. The batch made enough for one dinner’s worth for us, as well as another meal’s worth that I stuck in the freezer for a rainy day. Whisk water, honey, and yeast together in the bowl of a stand mixer until dissolved. Transfer bowl to stand mixer fitted with dough hook. Add bread flour and whole-wheat flour and mix on low speed until a cohesive dough forms, about 3 minutes; cover bowl with plastic wrap and let sit at room temperature for 30 minutes. Sprinkle salt evenly over dough and knead on low speed for 5 minutes. Increase speed to medium and continue to knead until dough is smooth and slightly tacky, about 1 minute. If dough is too sticky, add 1 to 2 tablespoons flour and continue mixing for 1 minute. Transfer dough to large, lightly greased bowl; cover tightly with plastic and let rise at room temperature until doubled in size, about 1 hour. Spray rubber spatula with vegetable oil spray. Fold partially risen dough over itself (in half)by gently lifting and folding the edge of the dough toward the middle. Turn bowl 90 degrees; fold again. Rotate bowl again and fold once more. Cover with plastic and let rise for 30 minutes. Repeat folding, replace plastic, and let dough rise until doubled in size, about 30 minutes longer. Grease two 9-inchround cake pans. Transfer dough to floured counter and sprinkle top with more flour. Using bench scraper, cut dough in half and gently stretch each half into 16-inch log. Cut each log into 8 equal pieces and dust top of each piece with more flour. With floured hands, gently pick up each piece and roll in palms to coat with flour, shaking of excess. Arrange rolls in prepared pans, placing 1 in center and 7 spaced evenly around the edges lengthwise, making sure cut side faces up. Loosely cover pans with lightly greased plastic and rise until doubled in size, about 30 minutes. Thirty minutes before baking, adjust oven rack to middle position and heat oven to 500 degrees. 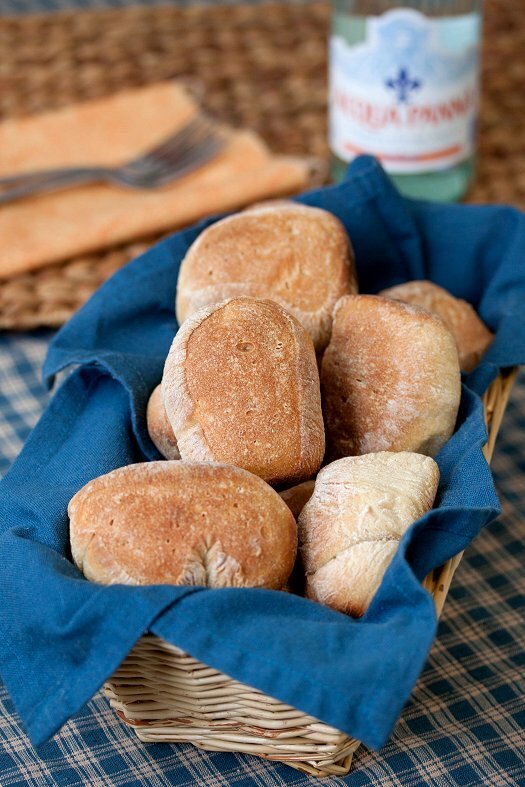 Spray rolls lightly with water, bake until tops of rolls are brown, about 10 minutes, then remove them from the oven. Reduce oven temperature to 400 degrees; using kitchen towels or oven mitts, invert rolls from both cake pans onto rimmed baking sheet. When rolls are cool enough to handle, turn them right-side up, pull apart, and space evenly on baking sheet. Continue to bake until rolls develop a deep golden brown crust and sound hollow when tapped on the bottom, 10 to 15 minutes. Transfer rolls to wire rack and let cool to room temperature, about 1 hour, before serving. these rolls are simply gorgeous! i have been meaning to make some rolls for a weekend dinner for the past few weeks. and you’re inspiring me to have at it! I love cook’s illustrated. my trusted source for so many classic, no fail recipes. I love dinner rolls, I think I could inhale that entire basket! These look deliciously perfect. Definitely going on my to-make list! These look so perfect! I love crusty breads and rolls!